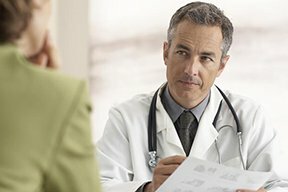 Would your doctor rather you be fat or thin? Fat acceptance is wrong on so many levels. 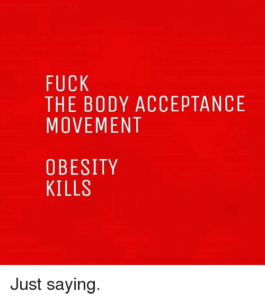 The fat acceptance movement needs to be reversed immediately. 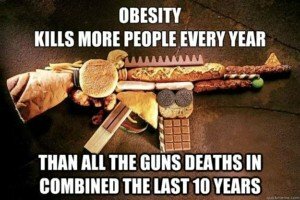 Obesity is never healthy. Fat acceptance can mean fat acceptance in the workplace and accommodations made on airplanes, etc. On the other hand, fat acceptance may mean the encouragement of obese men and women, particularly women, to embrace their bodies, to be “comfortable” with their bodies. And that’s where fat acceptance becomes wrong. I’m all for fat acceptance in the realm of Hollywood hiring more hefty people, especially women, to fill roles — roles that have nothing to do with being overweight. But fat acceptance should end where a person’s current or potential health and mobility problems begin. Frankly, I don’t know how an obese person can be comfortable in a body that gets fatigued easily, that gets exhausted trudging up a staircase, that has difficulty moving swiftly and efficiently. Fat acceptance is synonymous with smoking acceptance or heavy-drinking acceptance. Smoking, heavy drinking and obesity are all dangerous to the body. Rather than give up and resign to accepting your obese body, why not make a permanent commitment to trimming down? This is not about knocking or criticizing overweight women and men, even though many who read this article will take it that way. The human body is not supposed to be huge. Being obese was once an anomaly. Now, it’s closing in on being the norm. In fact, American Sports Data says that 63 percent of America is overweight, and about half those individuals are classified as obese. Encouraging obese women and men, or even moderately overweight women and men, to accept being hefty, is dangerous. There are many men and women walking around right now, who are trim and in their best health and fitness ever — who were once obese. Suppose they had decided to fall for the fat acceptance mindset. They then would have never lost the weight and got fit and healthy. But because they refused to accept being overweight, they committed to healthy lifestyle changes. Just today, at the gym, I was talking to a middle-aged man who was lean and muscular, no pot belly or slumped shoulders. He said he’d always been into weightlifting, but after becoming a bus driver, gained a wild amount of weight and ballooned up to 308 pounds. He was about 5-8. Imagine the sorry health he’d be in right now had he, at 308 pounds, fallen for fat acceptance. I also strongly doubt he would have met his new wife — who was working out with him. I’d say she was pushing 50. But she had a killer body, ripped arms, tight thighs. They even hit the gym while on their recent honeymoon. Yes, folks, it CAN be done: A healthier, fitter, trimmer body can be yours by seeing the facts for what they are: Obesity kills. Is Social Media’s Promotion of Obesity Making America Fatter? Do Obese Women Strength Train Differently than Thin Women? Should There Be Gyms just for Fat People?